Miso Crafty Knits: Miso Lucky! I've been on a roll lately, being blessed with such good luck! Hmm...I wonder if it has anything to do with my Karma? My most recent bout of good luck: the über cute owl purse that I won from Fiona's blog, Table Calender! 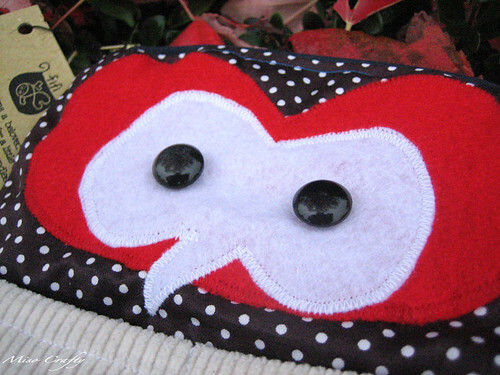 She was giving away this lovingly made cutie of a purse for her blog's birthday. If you think it's cute, you should check out her etsy shop here. It's full of sweet owl goodness! 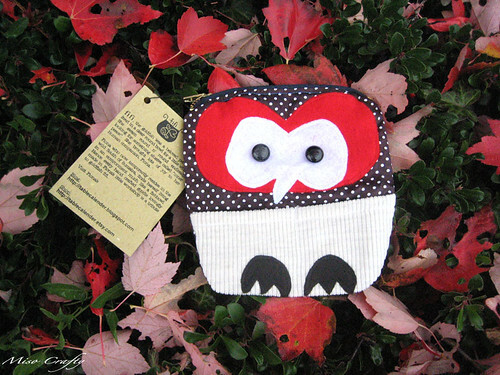 And what great timing to win an owl zip purse too. I've noticed that I've been loving all things owl-related for the fall/winter season. From the Owls sweater (that I'm just dying to knit up, but must finish the Tilted Duster first! ), to the Hoot Hat, to all the owl themed jewelry that I wish I could wear but can't...since I'm pretty sure the little one would most likely either put it in his mouth or rip it off my persons. Or both. I'm going to go with the latter on that matter. Isn't it just sweet? 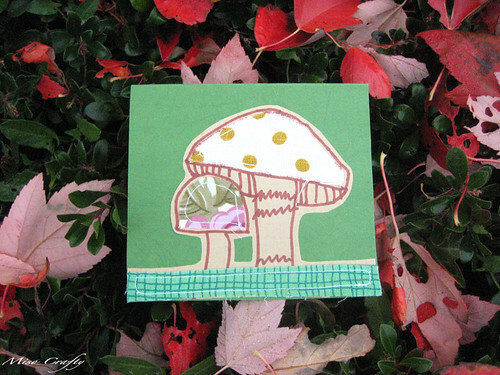 What a great idea for using up scrap fabric and to personalize a card too! I have a huge shopping bag full of scrap fabric and it feels like it's just getting bigger and bigger each time I go into my sewing closet! Anyways, I can't wait to fill my little owl up with goodies! Thanks again Fiona! !